Raw California Almonds. Please credit HealthAliciousNess.com if you use this photo with a link back to www.healthaliciousness.com Thank you! California's water-intensive almond industry has faced mounting criticism during the drought, especially after Gov. Jerry Brown announced that the state's first mandatory water cutbacks wouldn't apply to farmers. But several deep looks into where the agriculture industry's water goes point to alfalfa, not almonds, as the drought-stricken state's biggest water guzzler, according to the latest data from the state Department of Water Resources, which groups almonds and pistachios together in its evaluations. Alfalfa is raised almost exclusively to feed livestock. California provides more than 80 percent of the world's almonds and just 2 percent of the world's beef. But growing enough alfalfa to feed an animal for its lifetime -- and enough water for the animal to drink -- is a more water-demanding process than raising the nuts. 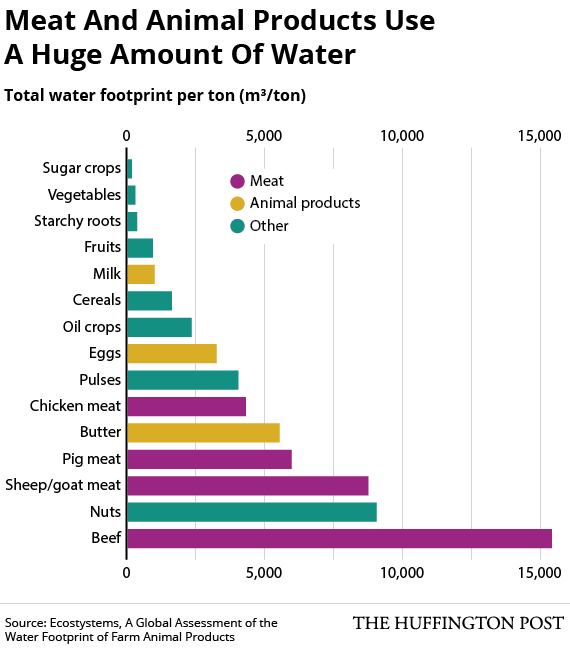 A 2012 study on global water footprints published in the journal Ecosystems found that beef requires more water than any other agricultural product. Livestock production can be relocated outside the drought zone -- and many cattle ranchers have moved. Almonds, however, can only be grown on a vast scale in California, their producers say. “They really don’t grow well anywhere else in the world,” Richard Waycott, CEO of the California Almond Board, told Wired. Although California cattle production has been moving elsewhere, Gizmodo notes, the state's alfalfa sales have grown drastically because farmers are selling it to Asia, according to a report from the University of California Cooperative Extension. 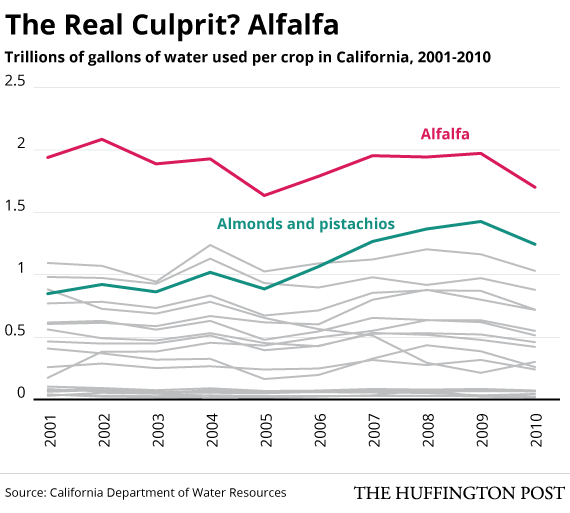 Growing almonds does require lots of water, with a single nut needing a gallon, Mother Jones points out. And the almond industry's growth from a $1.2 billion market in 2002 to a $4.8 billion market in 2012 has certainly put more pressure on water supplies. Unlike annual crops, almond orchards can't be left to fallow during drought. Smaller almond growers have been critical of big almond investors looking to profit from the world's skyrocketing demand, planting in areas too dry for the nuts, The Associated Press reported. Still, protein-packed almonds pay off. 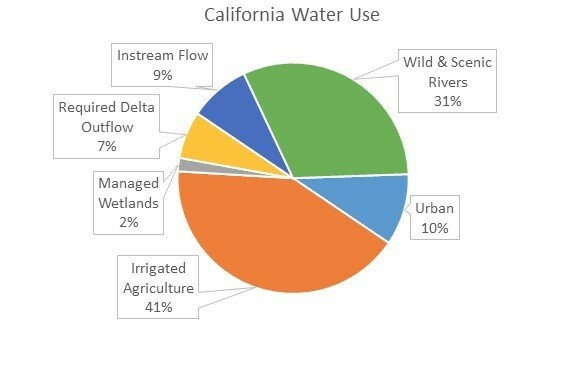 Los Angeles Times columnist Michael Hiltzik noted that fruits and nuts account for 45 percent of California's total agriculture revenue, but consume only 34 percent of agricultural water. Fruits and nuts are the only agriculture category that has a higher share of revenue than percentage of water used. "For farmers, [almonds are] one of the highest-value commodities," Ellen Hanak, director of the Water Policy Center of the Public Policy Institute of California, told Hiltzik. 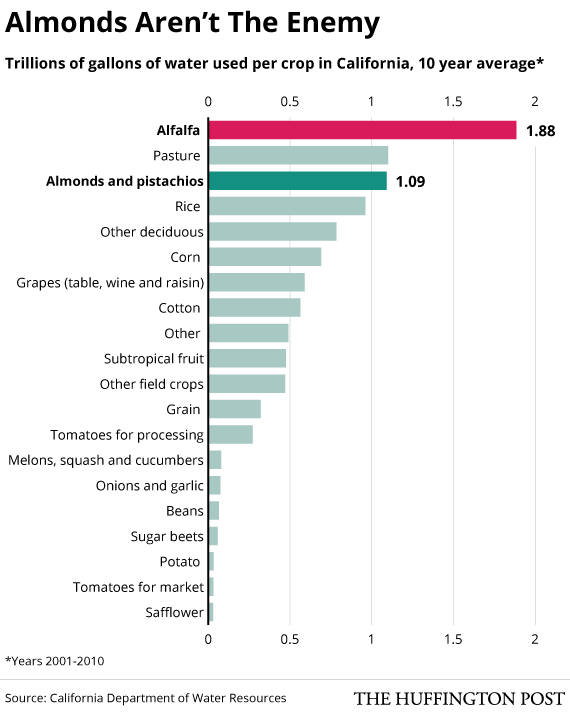 "The value of the water used on almonds is higher than on most crops."